Characterising the atmospheres of extrasolar planets is a booming activity, both from ground-based observatories and using the Hubble Space Telescope. 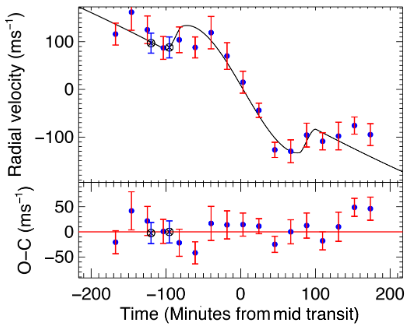 The latest study is of the highly-irradiated and hot planet WASP-103b, which was found by WASP-South transiting a star with an ultra-short orbit of only 0.93 days (Michaël Gillon et al 2014). Such features imply that WASP-103b has relatively clear skies, since cloudy or hazy atmospheres tend to produce flat, featureless spectra. The authors explain that: “This finding is in line with previous studies on cloud occurrence on exoplanets which find that clouds dominate the transmission spectra of cool, low surface gravity planets while hot, high surface gravity planets are either cloud-free, or possess clouds located below the altitudes probed by transmission spectra”. This entry was posted in exoplanet atmospheres, Hot Jupiters, WASP planets and tagged Gemini/GMOS, WASP-103b on August 22, 2017 by waspplanets. A team led by Brett Addison has been pointing the Anglo-Australian Telescope at WASP planets, trying to discern whether the planet’s orbit is aligned with the star’s spin axis. The rotation of the star means that one limb is approaching us, and so is blue-shifted, while the other limb is receding, and so is red-shifted. The planet can occult blue-shifted light (making a spectral line redder) and then red-shifted light. This is called the Rossiter–McLaughlin (or R–M) effect, and allows us to deduce the path of a transiting planet across the face of its star. All three planets appear to have orbital axes aligned with the star’s spin axis. The authors discuss the mechanisms and timescales by which orbits get “damped” by tidal effects and so become aligned with their star. This entry was posted in WASP planets and tagged Rossiter-McLaughlin effect, tidal damping, WASP-103b, WASP-66b, WASP-87b on March 21, 2016 by waspplanets.